A little magician girl from Pandemonium. The Mage comes to Arad from the dying magical world of Pandemonium, hoping to find a way to revive her land. However, she finds that in order to do that, she must first save Arad itself. 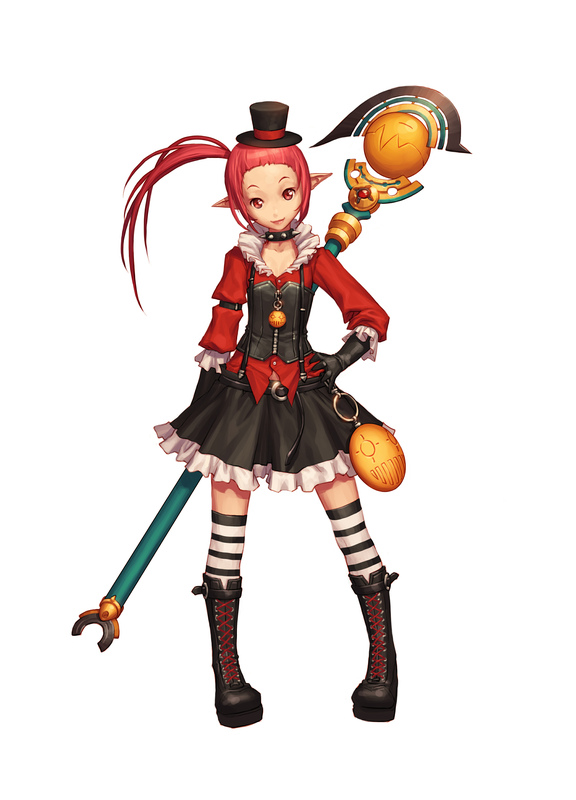 With the appearance of a petite young girl, the Mage is the smallest class in terms of physical stature. But she wields considerable magical power, casting spells that attack, confound and destroy the enemy. Close combat related stats--HP, Strength, Moving Speed, etc--are the lowest out of all characters. Due to low physical defense and low stats, careless play will often result in instant death. However, possesses skills to successfully escape or maneuver in close-ranged combat. Normal melee combo goes up to 3. The combo itself changes if the user decides to become a Battle Mage. Magic related stats, however, is significantly superior to all other characters. Various magical AoE skills can be mastered. Heavily relies on use of skills in battle. It is recommended that you either carry a decent number of MP potions, equip gears with MP regeneration. The Elementalist starts on early quite weak, having skills with long cooldowns and/or limited range and AoE but in her later and Awakening stages, her damaging and AoE power shines greatly as she will gain access to powerful spells such as Arctic Burst and Halloween Buster, while her previous spells are increased in size and power, allowing her to easily clear waves of enemies in short time. The Summoner brings her personal army to the fight. Capable of crowding the whole screen with her summons, she can overwhelm monsters through the sheer size of her mob. The Summoner possesses many skills that allow her to micromanage her summons. She can direct her minions to focus their attention on a particular target through Mark the Target! as well as teleporting them to her location through Mass Teleport. Because of her many minions, the Summoner rarely has to place herself in the line of danger, which allows her to safely direct her summons while staying in the backline. The Witch can be described as somewhat of a luck-based character, unique to her is the chance for her skills to fail (which are weaker, and sometimes detrimental, versions of her skills), succeed (normal variations of her skills), have a "Sleeper" success (improved variations), and (with her 2nd awakening) have a "JACKPOT" Success! (The best variant of her skills possible). As is expected of Witches, she is capable of flight with Broomstick Control when equipped with a Broom, giving her great aerial mobility. Through Bloom Powder, the Witch can enhance her melee attacks. She can summon monsters to aid her after killing enemies with Devolution Flyswatter and Giant Flyswatter. And she possesses powerful AoE Damage over Time skills with Lava Potion No. 9 capable of inflicting Burn (Status) and Slow (Status) while Acid Rain can weaken the enemies' defenses and attack strength. The Witch can operate various machines such as Raging Flame Furnace or Florae Collider for massive AoE range and damage around her. All in all, the Witch is a versatile class with various debuffs and holds. The Battle Mage is a fast-paced, combo-based class who possesses a unique combat mechanic centered around Chasers. 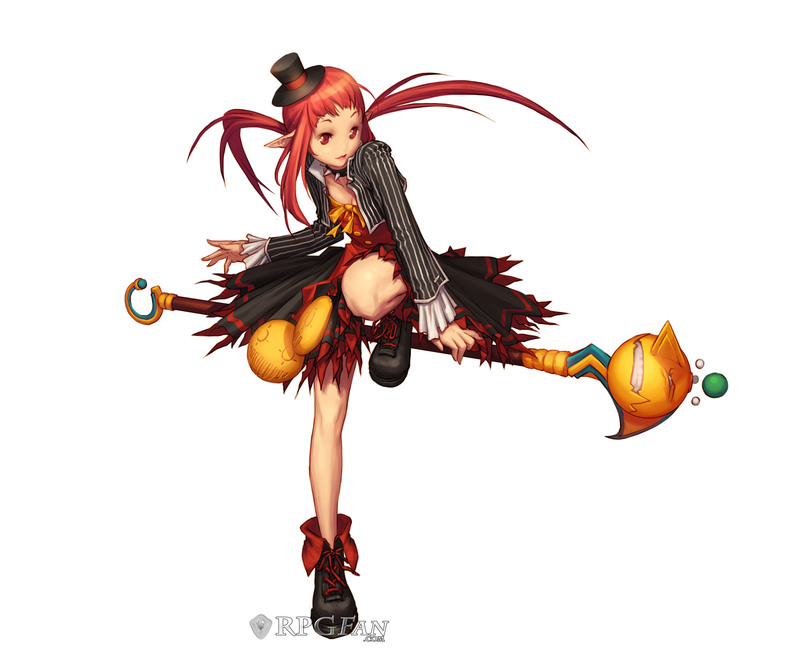 Chasers are magical orbs exclusive to the Battle Mage which are generated through the use of certain skills, or as she racks up combos while Chaser Generator is active. The Battle Mage can repeatedly fire off Chasers at enemies with Chaser Launcher as she continuously strikes them with her melee attacks, giving a strong mix of physical and magical attacks. The Female Mage must first reach level 15. A Female Mages' first attack can deal 8 to 10 times its regular damage at a very low chance. Likely an intended feature, it is speculated to be an homage to the Wizard from D&D.